In 2009, Borderlands was released by Gearbox. It was a critically-acclaimed game by the players due to its artistic style, cel-shaded first-person shooter with few RPG-like qualities. It also allows you to build (or control) one of the four characters in which way you want. It was so successful that a second installment was needed. “Borderlands 2” sports the same cel-shaded style and takes pride in having more loot and enemies to battle. Gearbox even made up a word called “bazillions” to quantify the number of guns a player can find and used in Planet Pandora (where most of the scenes take place). Borderlands’ ending was anti-climactic and left you questionable of the long journey you took just to be there. Luckily, Borderlands 2’s story is far different and compensates to the emptiness of the first version’s story. It is also more complex and exciting. a. There are plenty (bazillion) of powerful guns to use against your enemies. As well as having tons of new creative enemies to kill. b. The story is much better compared to the first one. Despite its complexity, it was still entertaining - filled with fun names from characters, the name of quests, non-player characters to the actual dialogue. It was never boring. a. You’ll be caught on visible and invisible corners. It contains plenty of things you can bump into which damages your character. b. “Borderlands 2” is getting you hyped up to have a cooperative experience despite its complexity. Also, enemies are tough to defeat. But given such a situation, it’s sad that you were only given a limited amount of missiles. This breaks the thrill of the game. 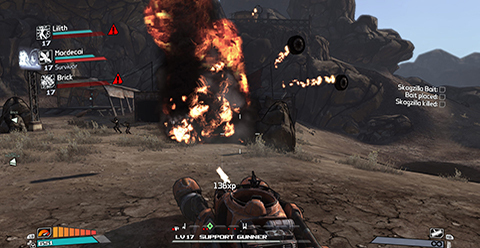 “Borderlands 2” is best played at the slowest speed as possible. It needs exploring and trying out all the mission board quests as possible. The various quests in this installment are refreshing compared to the first one being stale and monotonous. This version also leads you to meet new peculiar characters, to learn more about Jack, the vault, Pandora and the four vault hunters. It was filled with fun stories and engaging story arcs to experience. The downside of having plenty of fun side quests is having no easy way to track them. There should a standard method to organize the group quests which are part of the same area on the list, however in Borderlands 2 you can’t toggle them up easily. You need to manually browse through them, clicking the new ones and switching back to the map until you would discover where you need to go. Well, it’s just a little bother but it surely increases the playing time of the player which will not lead them directly to the finish. To sum up, Borderlands 2 is a tough, stylish and thrilling ride through everything which solidified Borderlands 1 as an excellent game. Just pick 3 friends, browse the character classes and proceed to the killings. It’s a game that won’t get you disappointed.